In light of recent comments made by Golden Boy Promotions President Oscar De La Hoya, who stressed his concern that fans around the world were not getting the fights that they deserve, I'd like to take this time to reflect on the top 10 fights that fans deserved, but never got, from De La Hoya while he was still fighting. Thank goodness we got the fights with Steve Forbes, Yory Boy Campas, Arturo Gatti, Ricardo Mayorga, Felix Sturm, Javier Castillejo, Derrell Coley and Oba Carr instead. 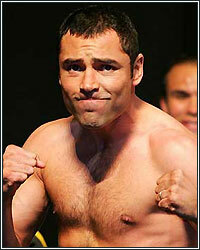 If only De La Hoya was just as passionate during his own career. I know what you're thinking. That sounds a little harsh for a guy who did consistently give us thrilling (and some not so thrilling) fights with the biggest, best, top fighters in the world, including Manny Pacquiao, Floyd Mayweather, Bernard Hopkins, Fernando Vargas, Shane Mosley (twice), Felix Trinidad, Pernell Whitaker, Ike Quartey, Hector Camacho, and of course, Julio Cesar Chavez. Hey, I'll be the first to admit, that's an untouchable resume, but honestly, the manner in which some of his own fights ended were a little controversial and "highly disputed" as well (Mosley, Quartey and Whitaker all come to mind), leaving most of us fans yearning for a more clear-cut resolution. Again, I'm not saying that De La Hoya ducked anyone. Although Pernell Whitaker, Ike Quartey and Winky Wright have their doubts, I would never accuse him of that. Nor am I implying that he had to make any of those fights, because after all, he did give us a hell of a lot of other great fights. That being said, I do believe that us fans deserved each and every one of the above mentioned fights just as much, if not moreso, than Pacquiao vs. Marquez III. The irony is that De La Hoya was in a much better position to make any one of those fights, at least a lot easier than Manny Pacquiao can get his own promoter, Bob Arum, to do business with another promotional company. I guess what I'm trying to say is, hey Oscar, get off Manny's back already! Just like you, he's also consistently fought some of the biggest, best, top fighters in the world, including Miguel Cotto, Ricky Hatton, YOU, Marco Antonio Barrera, Erik Morales AND Juan Manuel Marquez (twice). Manny's the top dog now, and I'm sure you can attest to the fact that sometimes, being the top dog means everyone is going to have to wait in line, including those that you've already fought twice. Unfortunately, like your good friend Shane Mosley, Marquez is just going to have to wait his turn. He's already been fortunate enough to taste the canvas four times against Manny...it's time to give someone else a turn. Now, if you REALLY want to give the fans something they deserve, how about giving us just one of the above mentioned fights. How about that rematch with Felix Trinidad? Or better yet, the third fight with Shane Mosley. After all, with all this talk about Manny Pacquiao and PEDs, I'm quite sure that loss to Shane still bugs you just a little bit, especially now that you know Shane was using BALCO steroids. Awwww! Man! Doesn't that piss you off just a little bit? It definitely bugs me just a tad bit. Where's that fire at? I know it's still in there. Every great fighter has one last great fight left in them. I don't believe you've had yours yet. Shane's ripe for the taking! Let's get back in there and smack him upset the head for using PEDs against you...do him like you did Fernando Vargas. Do it for the fans! There's your title right there. De La Hoya vs. Mosley III: This One Is For The Fans. That sounds just as good as "Who R U Picking?" Just something to think about, just in case the funds at Golden Boy ever start looking a little low. If you do steal my idea though, you have to at least give me the good credentials at those fights. I know, some of you may think I'm crazy, but hey, surely those fights, even now, have to be better than Hopkins vs. Jones 2, right? The scary thought is that either of those fights would probably be considered the biggest fight of 2010. Yikes!